Perhaps you recall that we reported on Friday that all the rides at Astroland had been put up for sale and were listed as being available "after Labor Day." It gets curiouser. Now, the Post reports that the city and Astroland's owner are trying to "iron out an 11th-hour deal to keep the amusement park in Coney Island after the summer." "I really feel we can make this happen," said Albert, who sold the park's 3.1 acres of land to developer Thor Equities last year but still owns nearly all its rides. Thor will let Albert operate the park this summer but is preparing to clear the land shortly after Labor Day so it can be incorporated into the developer's proposed $2 billion, year-round entertainment complex. The city wants to move Astroland between the park's western end off West 10th Street and the eastern edge of KeySpan Park at West 16th Street, sources said. 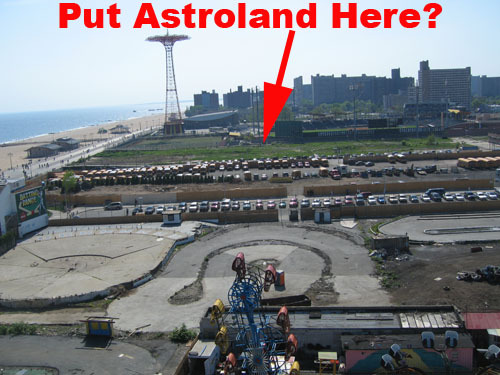 "We all want to keep Carol and Astroland in Coney Island," said Coney Island Development Corp.'s Chuck Reichenthal. Listen closely, and you can almost hear the sounds of negotiations being conducted that will determine the shape of the final deal between Thor Equities and the city. Once the summer is over, It is over, you can never go home again, unless they really do not close Astroland.